For over 40 years Tidyco has maintained its position as the leading supplier of hydraulic and pneumatic products and services to the rail sector. Part of the reason for the company’s success is its unwavering commitment to quality management, which is why it worked with SGS United Kingdom Ltd to achieve ISO 9001:2015 certification. A genuine British engineering success story, Derby based Tidyco has built its reputation on an ability to supply state-of-the-art hydraulic and pneumatic solutions to the rail sector, as well as working with defence, utilities and manufacturing organisations. During the course of the company’s existence its reputation has extended beyond its homeland and it now has customers in over 50 countries across the globe. From its Nottingham Road headquarters Tidyco is able to offer advice and cost-effective products and services for almost any hydraulic and/or pneumatic project. As well as boasting an in-house team of engineers with unrivalled expertise, the company has also embraced the business benefits of the internet by investing heavily in IT systems. Its online shop and ordering system provides the highest levels of service and every single customer is kept informed at all stages of the supply process. Account customers can also view their orders and track them through the manufacturing process, from start to finish. In addition to the supply of hydraulic and pneumatic solutions to a wide variety of global customers, the business also operates a Hose Doctor Division, supplying emergency hydraulic hose replacement to a UK demographic 24/7/365. Furthermore, Tidyco also supplies air conditioning, gas boiler and commercial heating system design, supply and on-going planned maintenance services. Recent expansion has witnessed the organisation launching auto electrical and commercial electrical service provisions to both new as well as existing clients. Tidyco asked SGS to carry out a pre-assessment on its QMS, explain the changes that are contained within ISO 9001:2015 and establish what would need to be done to comply with the new standard. ISO 9001:2015 introduced a number of new features to make companies assess risks, identify opportunities for improvement, and effectively manage and measure performance across all operational levels. As such, senior management must now demonstrate a greater commitment to, and have direct involvement in, its QMS. ISO 9001:2015 rubber stamps Tidyco’s operational credentials and has further improved integration and cooperation amongst its internal stakeholders – from the shop floor to senior management – by defining a standard of operation that is designed to exceed customer expectations. To ascertain the effectiveness of this approach, the SGS auditor spent time with representatives from across the business including shop floor manager, Liga Aldermane, stores manager, Joe Rowe, and Jason Bembridge, a recently qualified apprentice. They provided valuable input and helped configure the QMS. Its dedication to producing components of the highest quality led to Tidyco investing in new tube-bending technology – part of an on-going investment programme that allows it to control the production process in line with the standards required by ISO 9001:2015. 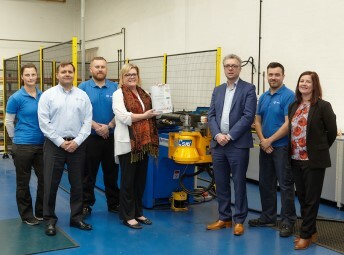 ISO 9001:2015 certification allows Tidyco to focus on the quality of its operational activities and helps to ensure that customers consider it the hydraulic and pneumatic solutions supplier of choice. Tidyco’s Philip Mason concludes. ‘Our culture of continual improvement is vital in maintaining a market leading position and our determination to grow the company also means that we are able to contribute to the economic success of the region. I would therefore like to congratulate the team for all the hard work that has gone into achieving ISO 9001:2015 and thank SGS for its support, advice and guidance throughout the process. SGS recently presented a live webinar focusing on demonstrating data privacy with BS 10012:2017 and ISO/IEC 27001:2013.